The Ministry of Petroleum (MOP) (Persian: وزارت نفت‎ Vezârat-e Naft) manages the oil industry, the producer of oil and petrochemical products. MoP is in charge of all issues pertaining to exploration, extraction, exploitation, distribution and exportation of crude oil and oil products. In addition, according to the "Imports and Exports Regulation Act", issuing import licenses for such products is also among the functions of the Ministry of Petroleum. According to BP, Iran's has 137.6 billion barrels (2.188×1010 m3) of proven oil reserves and 29.61 trillion cubic meters of proven gas reserves. Iran ranks third in the world in oil reserves and second in gas reserves. It is responsible for applying the principle of Iranian ownership and sovereignty over oil and gas reserves. Also, it is undertake the separation of sovereignty tasks from management and development of country's oil and gas industry. The Ministry of petroleum was established after revolution in Iran and in the interim government of Bazargan, after departure of Hasan Nazia, the managing director of National Iranian Oil Company from the country in 1979. The organizational structure of this ministry consists of a central headquarters and four subsidiaries, including National Iranian Oil Company, National Iranian Gas Company, National Iranian Petrochemical Company and National Iranian Oil Refining and Distribution Company. It monitors the operations of exploration, extraction, marketing and sale of crude oil, natural gas and oil products in the country through its subsidiaries and subsidiaries. In addition to meeting its major energy needs, the ministry supplies over 80% of foreign currency earnings by exporting crude oil and refined petroleum products. According to the Fourth Economic, Social and Cultural Development Plan, the Government has been required to transfer at least 10% of the activities related to the exploration, extraction and production of crude oil to the private sector, while in the meantime retaining its ownership of oil resources. This is also the case in other fields of the Ministry of Petroleum's activities. Iran plans to invest $500 billion in the oil sector until 2025. As of 2010, US$70 billion worth of oil and gas projects are under construction. Iran's annual oil and gas revenues will reach $250 billion by 2015. The Ministry of petroleum of Islamic Republic of Iran was formed with the aim of applying the principle of Iranian national ownership and sovereignty to oil and gas resources, and separating sovereignty functions from company in the management and development of oil and gas industry of the country. Since the petroleum industry has a special role in the country's economy as a propellant industry and plays a key role in achieving the major goals of national economy, the ministry's performance is very important. Iran holds 836.47 billion barrels of liquid hydrocarbon reserves (crude oil, liquids and gas condensate) and about 34 trillion gas reserves. It is ranked first in the world in terms of having a total hydrocarbon reserves and in terms of energy security in the world. Also, the privileges like geopolitical position of the country and availability of powerful human capital have given it more strength. Following the announcement of this proposal, “the law of oil Nationalization throughout the country and two-month extension to Petroleum Commission to study around implementation of this principle” passed in National Assembly and eventually in the Senate on March 29, 1950. Thus, The National Iranian Oil Company was established. First board of directors of National Iranian Oil Company was constituted by implementing the law of oil industry nationalization and after expropriation of former British oil company in June 1951. Then, new rules were adopted for this new company. The legal framework for activities of National Iranian Oil Company in discussion of hydrocarbons sources and its products was determined by approving the “Law on Development of Petrochemical Industries (with subsequent amendments)” on July 20, 1965 and the “Law on Development of Gas Industry” on May 25, 1972. In addition, the extent of Iranian or foreign companies and firms has clarified to participate in petrochemical product plans. Finally, a detailed description of presenting and receiving proposals, signing contracts, contract termination, conservation and preventing environmental pollution, maintaining Iran's interests and pricing conditions were presented by the approval of first “Oil Act” on August 8, 1974, in addition to defining the terms and conditions of work within hydrocarbon resources of whole country. Upon approval of first “Oil Act”, the “Law on Statute of National Iranian Oil Company” was ratified in five seasons on May 17, 1977. “General and capital”, “subject, duties, rights and authorities of company”, “the entity of company”, “balance sheet and profit and loss account” have formed first four chapters of the statute. In the fifth chapter of this law is also addressed to “other regulations”. Subsequently, the “Statute of National Petrochemical Company” and “Statute of National Iranian Gas Company” were approved on November 21, and November 25, 1977, respectively. After Islamic Revolution of Iran, the editing and approval of new laws were also on the agenda of Islamic Consultative Assembly with the necessity of following some principles and with regard to departure of foreign experts. Hence, new oil law was approved on October 9, 1987. Since the 1979 revolution in Iran, the country has been under constant US unilateral sanctions. The first U.S. sanctions against Iran were formalized in November 1979, and during the hostage crisis, many sanctions were leveled against the Iranian government. By 1987 the import of Iranian goods into the United States had been banned. 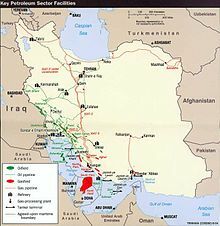 In 1995, President of the United States Bill Clinton issued Executive Order 12957, banning U.S. investment in Iran's energy sector, followed a few weeks later by Executive Order 12959 eliminating all trade and investment and virtually all interaction between the United States and Iran. The features of fifth development plan in oil industry include: a systemic template of a set of interconnected components that interact with each other to exchange data, information, materials and products, and they perform a targeted move. Also, different parts of the plan have been coordinated and have been seen as a value chain in industry as a whole. Objective 2: Optimum use of hydrocarbon reserves of the country as backing and stimulus for sustainable economic development of the country. Objective 5: Establishing effective and constructive interaction with energy producer and consumer countries; playing management role of Iran in energy distribution and transit. Objective 7: Achieve advanced technology in oil, gas and petrochemical industries to reach the second position of science and technology in the region. National Iranian Oil Company (NIOC) is in charge of oil and gas exploration and production, processing and oil transportation. National Iranian South Oil Company (NISOC) is an important subsidiary of NIOC. NISOC is producing about 83% percent of all crude oil and 16% percent of natural gas produced in Iran. The huge reserves of natural gas put Iran in the second place, in terms of the natural gas reserve quantity, among other countries, only next to the Russian Federation, with an estimate of proven reserve quantity close to 23 bcm. Iran's gas reserves are exploited primarily for domestic use. National Iranian Petrochemical Company (NPC) handles petrochemical production, distribution, and exports. National Iranian Petrochemical Company's output capacity will increase to over 100 million tpa by 2015 from an estimated 50 million tpa in 2010 thus becoming the world' second largest chemical producer globally after Dow Chemical with Iran housing some of the world's largest chemical complexes. Arvandan Oil & Gas Co.
Petroleum Engineering and Development Co.
Iran's oil and gas projected revenues chart by the International Monetary Fund. Officials in Iran estimate that Iran's annual oil and gas revenues could reach $250 billion by 2015 once the current projects come on stream. Iran's top oil export destinations, 2010. Iran’s total revenues from the sale of oil amounted to $77 billion in Iranian year 1387 (2008–09). The average sale price of Iran’s crude oil during that year was $100 per barrel. According to the National Iranian Oil Company, Iran’s average daily production of crude oil stood at 4 million barrels (640,000 m3) per day. Of this amount, 55% was exported and the remainder was consumed domestically. As of 2010, oil income accounts for 80% of Iran's foreign currency revenues and 60% of the nation's overall budget. Iran exported over 844 million barrels (134,200,000 m3) of oil in the one year to 21 March 2010, averaging around 2.3 million barrels (370,000 m3) a day. The exports included around 259 million barrels (41,200,000 m3) of light crude and more than 473 million barrels (75,200,000 m3) of heavy crude oil. Japan, China, South Africa, Brazil, Pakistan, Sri Lanka, Spain, India and the Netherlands are the main importers of Iran's crude oil. Iran's annual oil revenues reached $100 billion in 2011. Iran's annual oil and gas revenues are expected to reach $250 billion by 2015, including $100 billion from Iran's South Pars giant gas field. ^ a b c "irantradelaw.com" (PDF). Archived from the original (PDF) on 10 March 2013. Retrieved 10 June 2015. ^ "Fars News Agency : مدیرعامل بانک ملت: تقویت تامین مالی پتروشیمی‌ها با راه اندازی یک صندوق جدید". www.farsnews.com. Retrieved 2018-05-19. ^ "Ministry of petroleum iran". Tarikhema.org (in Persian). Retrieved 2018-05-19. ^ a b "Iran Sanctions". Retrieved 10 June 2015. ^ "Persons referred to at point (2) of Article 1". Official Journal of the EU. October 2012. Retrieved 16 February 2013. ^ "وزارت نفت جمهوری اسلامی ایران". ویکی‌پدیا، دانشنامهٔ آزاد (in Persian). 2018-05-07. ^ "PressTV-'Iran's gas sales to reach $100bn'". Archived from the original on 11 June 2015. Retrieved 10 June 2015. ^ Cite error: The named reference businessweek.com was invoked but never defined (see the help page). ^ "Iran: Fate of $66 Billion in Oil Revenues Unknown". Payvand.com. Retrieved 2012-01-09. ^ "Iran's massive oil revenue discrepancies". UPI.com. Retrieved 2012-01-09. Wikimedia Commons has media related to Ministry of Petroleum of Iran. This page was last edited on 26 January 2019, at 17:13 (UTC).